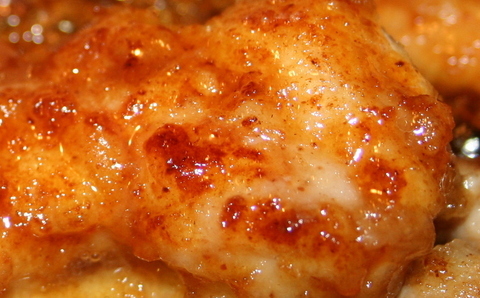 Succulent honey lime glaze simmering over chicken breasts - this one is a keeper! It's a snap to make. I recommend assembling the glaze ingredients before proceeding with the rest of the recipe. I deviated from the recipe somewhat, using a little olive oil to the heated pan before adding the butter because the recipe serves 2 and I had to double it. I had a lot of chicken on hand, and I didn't want to use a lot of butter in the process- just enough to give it that goood, buttery taste. It came out great. Thanks to Janet for sharing! In a large resealable plastic bag, combine flour & cayenne. Add chicken, a few strips at a time, and shake to coat. In a skillet, brown chicken in butter on all sides. Combine the lime juice, honey, brown sugar and Worcestershire sauce; pour over chicken. Cook for 1-2 minutes or until juices run clear and sauce is thickened. If there's one dish I love, it's a good shrimp creole. I couldn't find my old Southern Living standby, so I looked at a few on the FoodNetwork website. There's one by Paula Dean, but so many of her recipes lately have come out flat and rather unremarkable. And who better to go to for a creole recipe then the king of Cajun cooking? Last night I tried Emeril's recipe and it's a keeper. I will definitely make this one again. The recipe calls for 15 minute prep time and 45 min. cooking time. I had thought I could prepare all the ingredients and then go off and let it simmer. Well, not so much. I spent the majority of the time in the kitchen stirring, adding new ingredients and fixing the rest of the meal. Still, I'd do it again. Rick absolutely loved this recipe and Sam and her boyfriend gave it thumbs up. Some tips: The recipe calls for a homemade creole seasoning mixture, which you might want to prepare a day or so ahead of time. It will give you about 2/3 cup of spice mixture, which you can use in other fish or Cajun dishes. The recipe doesn't state how much of the Essence to use, so I'd do a taste test. .I ended up adding more essence to the simmering dish after adding the shrimp. I had been afraid to add all the Essence at once because it also calls for frequent dashes of salt and cayenne through out the cooking time. I wanted a good after taste, not heartburn. Remember the flavors will develop as it cooks, so go easy at first. There is a store bought version of Essence, which I don't like at all, and was relieved to find this homemade mixture tastes great and goes well with the recipe. It's easy to put together and you'll probably find most of the ingredients in your spice cabinet. Are you one of those who don't like to taste the spice ON the shrimp itself? Just add the Essence to the pot instead of sprinkling it on the shrimp. That worked great for Samantha, who doesn't like a real spicy shrimp. It also calls for 2lbs of tomatoes, peeled and chopped. I substituted 2 cans of diced tomatoes, since that's what I had on hand. Serve with white rice and a good french bread. I've decided to post the whole recipe here, because the Food Network sometimes takes their recipes off the website. Or click to the link above to print. In a large saucepan (one gallon), over medium heat, melt the butter. Add the onions, peppers, and celery to the pan. Season the vegetables with salt and cayenne. Saute the vegetables until they are wilted, about 6 to 8 minutes. Stir in the bay leaves, tomatoes, and garlic. Season with salt and cayenne. Bring the mixture up to a boil and reduce to a simmer. Simmer the mixture for about 15 minutes. If the mixture becomes too dry add some water. Season the mixture with the Worcestershire Sauce and hot sauce. Whisk the flour and water together. Add the flour mixture to the tomato mixture and continue to cook for 4 to 6 minutes. Season the shrimp with Essence. 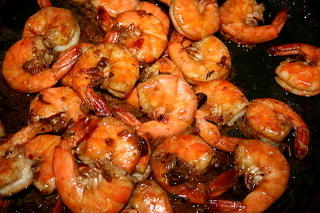 Add the shrimp to the mixture and continue to cook for about 4 to 6 minutes or until the shrimp turn pink and curl up. Stir in the green onions and parsley. Check the seasoning and add more salt and cayenne if needed. Serve the Shrimp Creole spooned over the rice. 1 tablespoon dried thymeCombine all ingredients thoroughly. With the weather turning chilly, I thought I'd make up a big pot of Corn and Potato Chowder from Southern Living's November 2007 issue. It looked so good. I spent an hour or so in the kitchen, and after all that work, I'll give it 2 thumbs down, for blandness and over-priced, unnecessary ingredients. I bought the Yukon Potatoes as requested, but I can't see why ordinary potatoes wouldn't be just as good. The creamy taste of a Yukon gold is lost in this recipe. I added the can of yellow and white whole kernel corn, which didn't improve the flavor at all. What was the point of the white corn? It doesn't stand out at all. You could get away with a can of kernel corn just fine. I bought the frozen vegetable mix as suggested, using Bird's Eye brand. I didn't buy the cream of mushroom with roasted garlic soup, choosing instead to use Campbells Cream of Mushroom, and added several cloves of minced garlic instead. I really don't think it would have made a difference. What the soup is missing the most, is a richness to the cream base. There's a grainy, flour-y taste to it that I just didn't find satisfying. Rick ended up going back into the kitchen to grab the pepper grinder and coated the top of his bowl liberally. It didn't call for any other seasonings, beyond hot sauce, which I added. If you're looking for a real good corn and potato chowder recipe, I'd just look elsewhere and skip this recipe entirely. I have a whole pot of it in the kitchen, Tomorrow I'll try to doctor it up and see what I can do to fix it. Whew! I've spent most of the day in the kitchen. Britt's colorguard is spending the last days of Christmas vacation in camp and they had three days of 9 a.m. to 9 p.m workouts. The parents chip in for a potluck dinner for the girls and the staff each night. Today I brought in individual key lime "pies" which I made in cupcake tins, they came out great. Since Rick was hovering around trying to eat them, I made him a separate pie. For the family, I also made a honey BBQ marinade for ribs that will be put in the slow cooker tomorrow morning, They're going to marinate overnight and cook allll day. This is a new recipe too. I'll share it if it comes out well. We can't use our BBQ as it's broken, just another casualty in this money pit of a house, lol. oh gawd, some days, you just have to laugh. Rick's fuel tank had a leak in it, he's been fixing that all day, so no, we haven't been working on the kitchen/bathroom/bathroom/pool/... or BBQ! *Moving right along, Percy is here to endorse his new cat toy, something he never does for this blog, Because, my friends,. Percy is not a "play with the cat-toys" type of cat. If he were human, he'd be a grouchy old man. I was in PetSmart last week when I saw a cat chasing the little plastic ball that is inside the tract, all around and around. Aside from the obvious fact.... he had gone stir crazy from being caged -- the cat was having a grand old time. I have no idea why, but I brought the toy home. Better that than the cat. And everyone was surprised because I hardly ever buy cat toys, mainly because Buddy eats 'em and because they have a big, wide world outside to explore, and that world is free of charge. Anyway, Percy loves this thing, especially the little mouse with the catnip in it. Boy, he just nuzzles that mouse and caresses it adoringly. He can't be bothered with the the useless round balls that annoy the daylights out of him when I'm pushing them around in circles. He usually looks at me with this disgusted look and shakes his head. But he does love that mouse. He'll cross the room to go nuzzle that mouse. I'm going to have to put it in the back bedroom, just for the two of them..
Zoey hasn't figured it out yet. I thought of Zoey when I bought this toy because he still likes to chase his tail. I told you all, he really ain't right in the head. But so far, he's not sure how to operate it. He likes to watch the balls go around, as long as I push 'em. Well, I don't have enough time for all that. For crying out loud, how hard is it for him to stick his paw in there and bat it. He gets so excited when the ball goes around, but he won't DO anything to make it happen. Rico didn't like it because it made noises and Rico doesn't like his toys to make ANY noise. Rico does not like commotion! When there is commotion, Rico sprays! 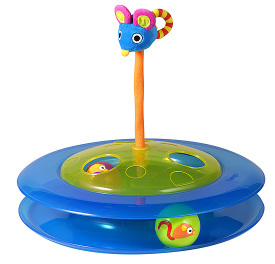 So the census is, one out of three cats prefer this toy to any other toy on the market! Good thing they don't actually know that there are other toys on the market. Or even what a market is. You're gonna have to lick the bowl clean, you know. 1 (5.9 oz.) package chocolate instant pudding mix. Whisk together chocolate instant pudding mix and 2 cups milk for 2 minutes. Cover pudding, chill 5 minutes. Place 2 cup crushed cookies evenly on bottom of an 8 cup bowl. Spread half of cream cheese mixture over crushed cookies, sprinkle with half of pecans. Spread all of pudding evenly over top; spread remaining cream cheese miture evenly over pudding. Sprinkle with remaining cookies and pecans. Chill well, until serving. Mmmmmm, so good. The recipe is here. I had a package of frozen, deveined shrimp which I thawed for this recipe. The sauce should simmer 15 minutes before adding the shrimp, which is then cooked in the shell. This is a messy dish to eat, but finger-lickin good! Spicy too, but I like it that way. Make your side dishes before you start this one. And remember, I don't like scallops, as a rule, but I think this one is a keeper. As it cooks, it forms a creamy lip-smackin sauce. For the record, I made it with Florida bay scallops, and these are smaller than typical sea-scallops. If using sea scallops, I recommend following her advice to cut them in half; these should be bite sized for best flavor. Definitely use the unsalted butter, it makes a difference. Rinse them off, and pat them dry well with a paper towel, otherwise the flour that you dredge them through will make them mushy. I coated with a dusting of flour, salt and pepper and let it sit covered in the fridge while I went to pick up Britt from guard. Once we got home, I followed the rest of the recipe using scallions instead of shallots, because that's what I had on hand. It was delicious! Oh, and be careful not to overcook!!!! 1 lemon, cut in 1/2If you're using bay scallops, keep them whole. 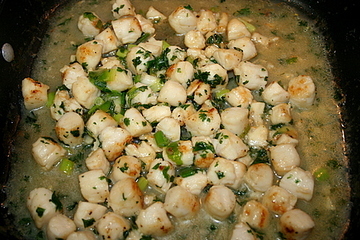 If you're using sea scallops, cut each 1 in half horizontally. Sprinkle with salt and pepper, toss with flour, and shake off the excess. When I was a kid, the best burger in town was at the Royal Castle in Miami, Florida. I'm not entirely sure of the time-line, but long before White Castle and Krystal burgers came on the scene, Royal Castle was infamous in the Miami area for its small square burgers with little tiny onions on top, and great buns. Oh, and their root beer, or Birch beer, that was out of this world. 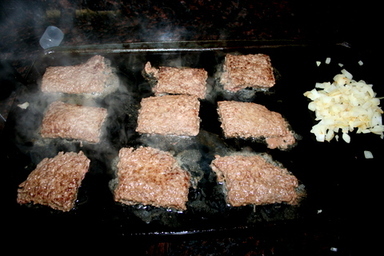 In any event, this past weekend, hub and I were watching Alton Brown on the Food Network, and he was making the mini square burgers. He calls them Mini MAN burgers. 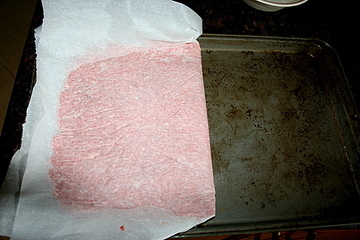 It was his method that fascinated me as he rolled ground beef out into a large square on a jelly roll pan, seasoned well, folded it in half and cut the squares with a pizza cutter. 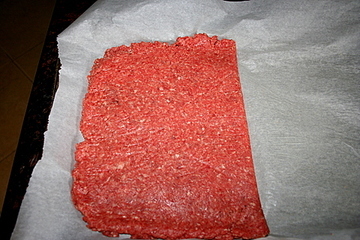 I was always taught that if you handled raw beef too much, it would make for a tough hamburger. But these came out sooooo good. Normally I use lean ground beef, but I'm not sure that would work for this recipe. I may try it that way in the future and test the results. In any event, this recipe is a keeper. Don't pound the beef, just roll it out. And use the wine bottle, as Alton suggested on the show. It helps get the beef into the corners and did a neater job than the rolling pin. You have got to try them! It did remind me a bit of the old Royal Castle burgers from all those years ago. 2 to 3 tablespoons mayonnaise. Preheat the oven to 250 degrees F. Preheat a griddle to 350 degrees F.
*notes: skip the grocery store brand hamburger buns and get the good sweet tasting buns for this recipe. I used Arnolds Potato buns, wrapped in foil, heated up and they came out great. 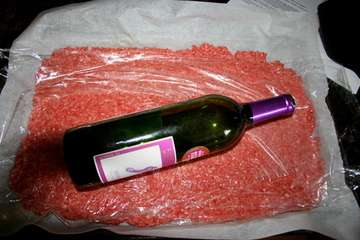 This is about one pound of ground beef after the first few passes with a rolling pin. It's not enough! It needs to be stretched thin, all the way to the edges of the pan. Roll gently and push evenly. Now we're making progress. 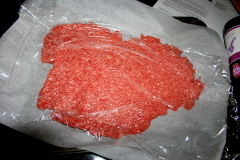 Plastic wrap goes on top of the burger as it helps you push the meat into all the corners of the pan more evenly. You want it thin because you'll fold it in half in the next step. I don't have a perfect square edge, but.. oh well. Cut into squares with the pizza cutter. Use a griddle for best results! I wish I had a picture of them inside the bun, or a more appetizing picture, but these cook quickly and everybody ate 'em up right away. Side note: consider making all of your side dishes before you start this recipe because they cook so fast. Smack yo lips, and Happy 4th! Here's the thing, I don't like chicken soup very much, so I didn't have a recipe on hand. 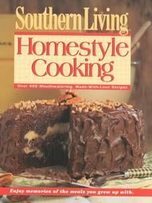 I did, however, have a hearty stock of Southern Living Cookbooks and where better to turn to for comfort food than Southern Living? I decided to make this soup and it was deeeeeelicious! I did make a few changes. It calls for six tablespoons of butter and flour, which I thought was too much. I reduced it to about 2 T butter and flour and it came out fine. Also used portabello mushrooms which were on sale, and diced them, sauteed in a little butter and then added them to the creamy base mixture. That came out GREAT! I'd advice using baby portabellos if you can find them. 1. It calls for one and a half pounds of chicken breast tenderloins to be baked and then chopped and added to the soup. However I used a rotisserie chicken in "mojo criollo" flavor from Publix (our local grocery) and it was even better. 2. The recipe is designed to be served immediately after cooking. However, I made the first part of the soup several hours in advance and let it simmer on low for several hours. 30 min before serving, I made the cream mixture and added it to the broth. I think that allowed all the flavors to come together. Instead of 6 cups of broth, I used two 32oz containers of Swanson's Organic Chicken Broth. 1 cup of rice instead of 1/2 cup. I don't remember how many carrots, zucchini or celery I used, just use your own ratio to taste. Fresh Parsley is a must. I don't see the reason for the six tablespoons of butter and flour called for in this recipe at all. Mine was very thick with a chock full of vegetables. This is a hearty soup and I really think you can get away with out using all that butter and flour. I used all 2 c. of the half and half. If your soup comes out watery, then increase the amount of flour/butter before you add to the soup. Remember, I had a lot of vegetables and rice to absorb the liquid. The cream mixture really does make a difference and it was delicious!. If the soup thickens somewhat as it cools, then add a little more cream or broth. Place chicken on a lightly greased 15x 10 inch jelly roll pan in a single layer. Bake 375' for 8 min. cool, coarsely chop and set aside. Or just go buy a rotisserie chicken. 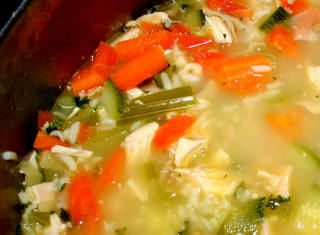 Bring chicken broth to a boil in a dutch oven, add rice. Reduce heat, simmer, uncovered, 10 minutes. Add carrot, celery and green onions, simmer 10 more minutes. Add zucchini and parsley, simmer 2 minutes. Remove from heat. (note, I just added all ingredients, brought it up to a low boil, reduced the heat and let it say on low for a few hours). * see mushroom advice, above. One of my resolutions for the New Year was to teach the entire family how to cook something more substantial than macaroni and cheese and spaghetti sauce from a jar. They all know how to heat something up that was already prepared, or make simple things like french toast and pancakes. But I want them to learn to make a real meal instead. By the end of the year, I'm hoping they'll feel comfortable going to the store to pick out the ingredients to cook a complete entree, even if it's just a small casserole or broiled chicken. And then I can retire from the kitchen for good. Anyway, Britt was up first. I decided to have her make her favorite dish, spaghetti and meat sauce, since she often asks me to make that instead of the store bought kind. I figured it was high time she learned to dice, saute and how to mince garlic without using a garlic press. For those of us who cook all the time, spaghetti sauce might sound too easy, but she's never really diced or sliced or browned beef all by herself. My goal was not to show her, but sit there while she did the work. I had her do it all. She peeled the onions and learned how to slice them so they can be diced into little tiny bits. She learned when to add the meat and how to flavor the pan before adding the meat and how to brown it up. (I didn't make meatballs this time around.) She learned which seasonings to use and when to add them. She learned that some types of ground beef produce a lot of fat that has to be drained and that the sirloin I happened to have on hand had very little fat in it. The only thing I did is smash the garlic with a carving knife, something she didn't want to attempt just yet. But she learned, and the sauce was delicious! I'll have her back in the kitchen as time goes on to prepare a little more every week or so. So far, she's helped me with a lot of the Christmas cookies and baked breads, recipes which are below. Rick and Sam are up next, although they don't know it just yet. I've decided Rick is going to make the Toscana Soup that he loves when he goes to the Olive Garden. I'll share that recipe with you all when the time comes. I'll have to ask Sam what she wants to make, not sure what her favorite meal is, beyond snow crab...? A few days ago I made the banana bread from Simply Recipes. There are as many banana bread recipes as there are cooks, and I was looking for a banana bread recipe that didn't have so much sugar in it. I thought this one fit the bill. Instead of shortening, it calls for 1/3 cup of melted butter to be mixed with the mashed bananas. I thought that seemed a little interesting. It turned out delicious, although I found the taste of butter just a tad too strong. I might have used too much butter, however. I thought I measured right, but you never know. However, three days later, it is still moist! It's not the best banana bread ever, but it's a good recipe. Here's another link to her banana muffins made with the same batter, only with the addition of a shot of espresso for an added kick. the espresso is optional. I also made good old Cranberry Nut Bread over Christmas. This is just the standard recipe from Ocean Spray Cranberries and if you haven't made it before, it's delicious. My mom used to make it all the time when I was a kid. This time, however.. I was out of the shortening that the recipe called for. I substitute an equal amount of stick margarine and it came out great. I used a lot of coarsely chopped cranberries since I love the taste of them when biting into the bread. I also used orange juice that had a lot of pulp in it, that gave it a good juicy taste as well. I still have a bag of cranberries leftover. Their website looks like it has some good recipes on it as well. So that's our cooking post for today. If you all have been active in the kitchen lately, let me know, I'm always looking for new recipes to try out! At last! the highly coveted Eggnog Pound Cake recipe is here! Samantha returned home from work tonight after I had threatened to disown her with the recipe, hastily written on a yellow sheet of legal notepaper. I have not yet made this one, since I've only had the recipe in my hand for twenty minutes, but since I promised to share it with you first, here we go! Note, I am copying this recipe word for word, and I'm not sure what size box of pudding mix should be used. I'm assuming the small 3.4 oz sizes. I'll have to find out. You could probably take an educated guess if you're a fine cook yourself. You may have to adjust baking times to fit your oven, depending on the size of pan you choose. I renamed this recipe for her. 1 box instant pudding mix. Mix together until thick. Bake at 350' for 45 min, or until toothpick comes out clean. This makes 1 Bundt, or 3 large loaves, or 5 mini loaves of cake.